3 Drawer Kitchen Island w/2 sliding doors, 2 Mesh Doors on each side. Features 3 deep drawers, 2 sliding doors that reveal storage with fixed shelf and 2 extra storage compartments behind metal mesh doors on sides. Barn doors on side offer convenience and rustic appeal. 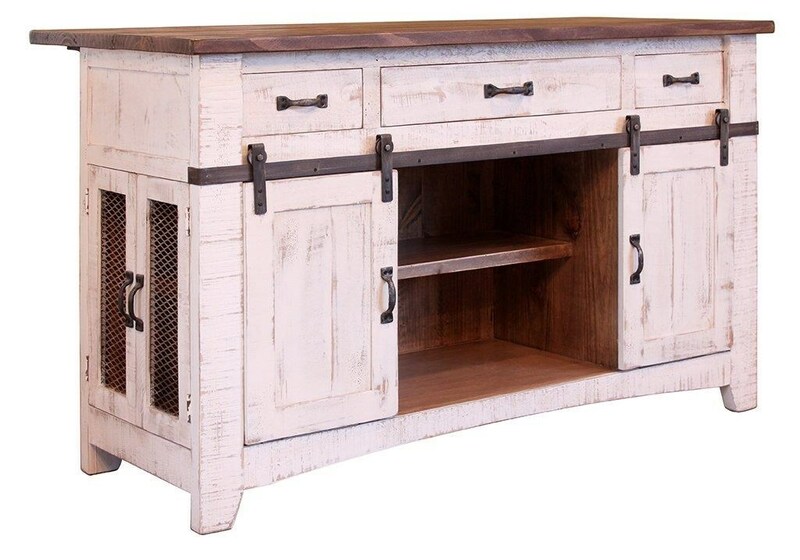 The PUEBLO WHITE Kitchen Island by International Furniture Direct at Miskelly Furniture in the Jackson, Pearl, Madison, Ridgeland, Flowood Mississippi area. Product availability may vary. Contact us for the most current availability on this product.